We continue the month of October with a game that is perfect for this Halloween-containing month. It's a game about eliminating ghosts from a haunted house, Extreme Exorcism. Let's take a look at the game with this review. How about some housekeeping of the supernatural kind? 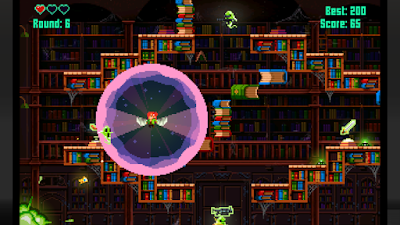 Extreme Exorcism boasts a relatively simple but engaging concept. 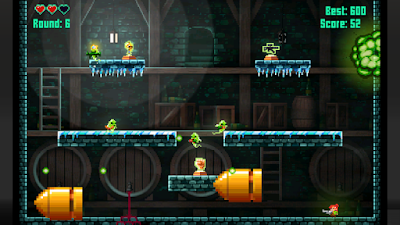 In this single screen action-platformer, you begin with an arena with a random spawning of weapons, and your goal is to eliminate the ghost wearing a crown. However, each round you do this, the ghost you need to defeat the next round will follow the same path you took in the last round, even using the same weapons. It's a devilishly clever concept that makes you not only need to be careful that you don't go crazy and fill the screen with bullets in one round, making the next round having the crowned ghost unleashing an onslaught of bullets, but remembering where you moved the last round can help you defeat the ghost the next round. 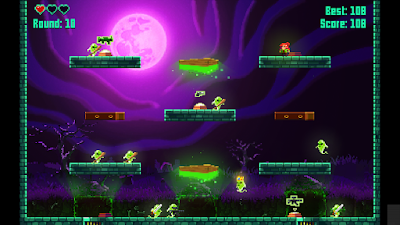 Arcade mode is the main mode of Extreme Exorcism. It has you and up to three friends locally going from room to room, defeating ghosts with the main goal of defeating the ghost wearing the crown. Each section of the haunted house Extreme Exorcism takes place in has five rooms of differently organized platforms and obstacles. Things may start off simple with only a modest selection of platforms to worry about while later levels introduce things like moving platforms, bouncy platforms, and spinning platforms. To move onto the next area of Arcade mode, you need to earn enough points. What starts out with an easy point total of 50 soon increases as you reach each new room of the haunted house. You and any other player with you along for the ride have three hearts to work with. Get hit by an enemy and your character is respawned into the room... pending they have a heart left. If not, a player can still come back as long as the surviving player(s) can kill a specific amount of ghosts. of doom with this one time use weapon. 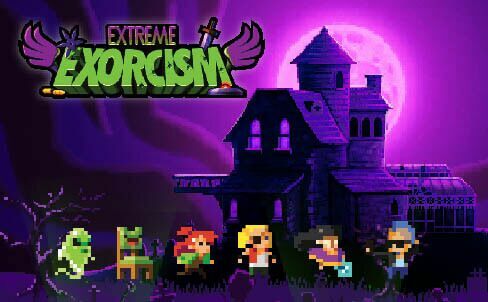 Alongside earning the ability to move onto the next room of the haunted house by earning a specific number of points, you earn new weapons that spawn in Extreme Exorcism's rooms by reaching certain ghost kill counts. What starts off with a modest pistol will soon open up with new tools of destruction like a shotgun that shoots off a tower of five bullets at close range, a harpoon that can shoot through more than one enemy at a time, and a grenade launcher that brings the boom. Bullets so big that even Super Mario's Banzai Bills would be jealous. 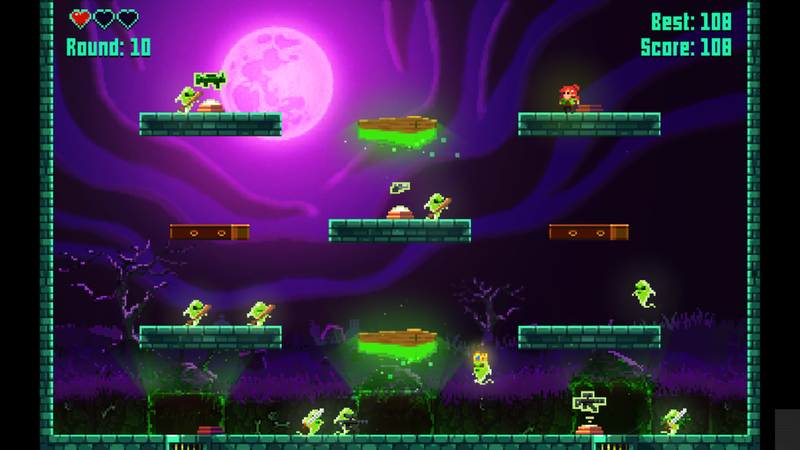 Arcade mode isn't the only mode available to you in Extreme Exorcism. In addition to Arcade, there are also Challenge and Deathmatch modes. Challenge mode is a one player affair where you're assigned tasks to accomplish, such as killing a number ghosts with only so many lives or bullets. Deathmatch is a mode for up to four players to take each other out in, where dead players will have their ghosts summoned, performing the same movements and actions they did when they were alive. A bummer for both Arcade and Deathmatch modes is that neither support online play. Perhaps wanting such would be asking too much of the small team at Golden Ruby Games, so in this viewpoint, it's something I can forgive. 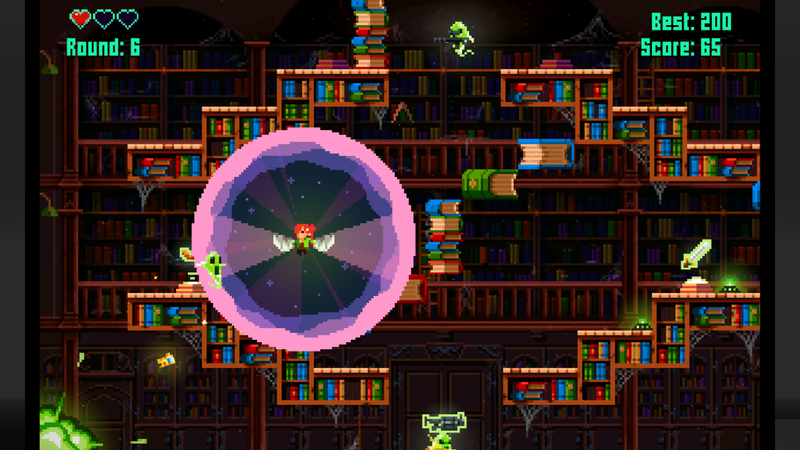 Extreme Exorcism is an enjoyable romp through a haunted house, but it does get quite repetitive the more you play. However, Challenge mode changes things up enough if you get burned out with the traditional modes available. With Golden Ruby Games' effort on the Wii U eShop, Extreme Exorcism stands a ghost of a chance against the competition to stand out on the storefront. Review copy provided by Golden Ruby Games.